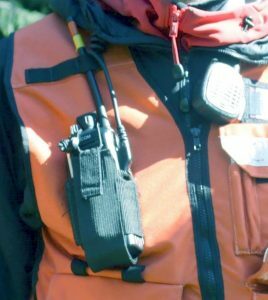 Distracted Driving and SAR - hand held radios illegal! The penalty for distracted driving in BC is now $543. It tripled on June 1st, 2016. The thing you may not know is that using a hand held radio is considered to be the same as using a cell phone under this legislation. Since my SAR group issues radios to all team members, which we regularly use to coordinate while responding to a task, this is of particular concern to me. I thought that I’d highlight the issue to the SAR community at large. (b) is securely fixed to the motor vehicle or worn securely on the person’s body in a manner that does not obstruct the person’s view of the front or sides of the motor vehicle or interfere with the safety or operating equipment of the motor vehicle. Needless to say there is a huge amount of confusion in the SAR community about this, and I’m hearing a lot of different things through various channels. I attended a meeting of the amateur radio group CARESS (Coquitlam Amateur Radio Emergency Services Society) the other night and heard of amateurs being ticketed for using a microphone that has buttons on it that allow you to change the channel and access other radio functions. The reason for this is that some police agencies have issued guidance that includes a photo of a hand mic instead of a hand held radio. Under the guidance and training that some police receive, they will consider any use of a radio that looks like the above photo (not a radio of course) to be illegal. For a larger discussion from an amateur radio point of view, the Detla Amateur Radio Society has a good blog post. (c) fire services personnel as defined in the Fire Services Act . This is where it would be great if some large governing body, say some kind of Search and Rescue Association that represented most of the ground SAR units in BC, would seek to clarify the legal stuff, and perhaps get an exception in place for SAR personnel. If you are pulled over rely on the good will toward SAR members, be polite, and explain to the officer you’re complying with the regulation under section 214.3. It is interesting that Alberta has a different stance on distracted driving legislation than BC, we typically follow you guys! I agree with pretty much everything you said. Thought it would be worthwhile to flush a few things out. I am a lawyer, but this is not legal advice. Do our SAR radio calls while driving get captured under the electronic devices / distracted driving prohibition? Section 214.1 of the Act defines an “electronic device” as 1) a handheld cellular telephone (or other hand held electronic device that includes a telephone function), 2) a handheld electronic device that is capable of transmitting or receiving electronic mail or other text-based messages, or 3) a prescribed class or type of electronic device. I think it’s fair to say that neither a portable or mobile SAR radio falls under definition 1 or 2. What about 3? Section 3(1) of the Regulation sets out the electronic devices that are prescribed for the purposes of S.214.1 of the Act. Included in that prescription are “hand microphones”. (The rest of the prescriptions – electronic devices that include a hands free telephone function, GPS, hand held audio players, and televisions – do not apply for our purposes.) “Hand microphones” are in turn defined by s.3(2) of the Regulation to be a communication device consisting of a hand held unit that a) is both receiver and microphone, is operated by a push and hold to talk function, and allows for oral communication but not for the transmission and receipt of oral communication at the same time. I think it’s fair to say that both portable and mobile SAR radios fall under the definition of “hand microphone”. They are therefore prescribed for the purposes of s.214.1 of the Act and are therefore considered to be “electronic devices”. So, generally, people are not permitted to use an electronic device – which includes our SAR radios – while driving. Are there any exceptions that would allow SAR members responding to a call get around this general prohibition? I admit, a weak argument, but I suppose one that could be tried in an attempt to fight a ticket in Court. Are there any other exceptions that would help SAR members? This is where the difference between portable and mobile radios comes into play. 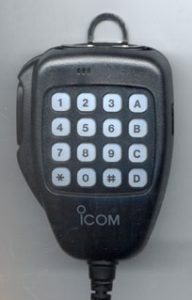 Section 9 of the Regulation says that a person can use a hand microphone (recall this would include our SAR radios) while driving if: 1) the device is within easy reach of the drivers seat, and 2) is securely fixed to the motor vehicle or worn securely on the person’s body in a manner that does not obstruct their view of the front/sides of the vehicle. Our mobile radios are definitely securely fixed to our vehicles, so it would appear that SAR use of mobile radios while driving is not supposed to fall under the distracted driving laws. What about our portable radios? I agree with what you have stated – for their use to be ok (from an electronic device/distracted driving point of view), they would have to be securely worn on our body. Practically, that means in our chest packs. (Further, I assume it means that we could not take the radios out of our chest packs to use/talk – we would have to keep them worn in the pack while using them in the car.) I note that the PDF in fact has a picture of a VHF radio worn in a chest pack to illustrate this as an acceptable practice. So that’s what the law looks like. Mobiles ok, portables ok if securely worn on person. As you note though, that’s not the end of the story. What the law may say (or at least how we are interpreting it) may not carry the day, at least on the road when pulled over. Police officers may be misinformed (or, hey, we might be incorrect too) about how this law is to be applied. I’d imagine they would encounter far far less VHF radios than cell phones during their enforcement duties. As you note above, there seems to be some confusion among some police re mobile radios with hand mics with buttons. I gather from your post that some police agencies have been using confusing pictures to provide guidance to their members. Again, this is not legal advice. Ryan thanks for taking the time to write such a detailed response, and especially for your non legal advice, but salient insight! Ultimately it comes down to clarification for SAR – I’m a big fan of the legislation as I’ve see far too many near tragic situations where people are using cell phones. I’d like SAR people to be confident on what they’re allowed to do, and to adapt to that. Since writing this post I received some communications from the Radio Amateurs of Canada telling me that their organization has held meetings on several levels also seeking clarity in the act. The way government moves (slowly) we can’t expect changes any time soon. For now we can hope that by highlighting this situation we’ve saved someone a fine.